Sorry if you feel badly done too by the head line. The shrubs in question major on one colour but as there are three shrubs I called them three coloured shrubs. It seemed logical at the time but I recognise you could have been expecting tri-coloured shrubs. 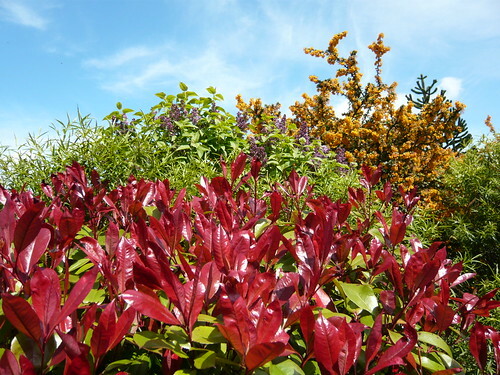 The red leaves of the Photinia fraseri is often called Robinia which is really best reserved for the False Acacia or Robinia psuedoacacia ‘Frisia. In the spring the new waxy leaves are a vibrant and shiny red only slowly aging to light green. This plant copes well in the shade in a clay soil. I give it no special treatment and it forms a key part of my low maintenance area. Behind the Photinia fraseri is another garden stalwart the Lilac. This small tree is just coming into flower and with a bit of sun each blossom will open a lighter colour and almost match the sky behind. As with the other shrubs here the Lilac likes the clay soil. The Berberis Julianae has been very good this year which I put down to the sunny dry March and the cooler climate since then. The angle of this photograph has changed and emphasis is placed on a white Hebe still to flower and the conical evergreen Picea. The shrubs at the front cover the trunk of the Lilac that can be a bit uninteresting other than when the Lilac is in blossom. 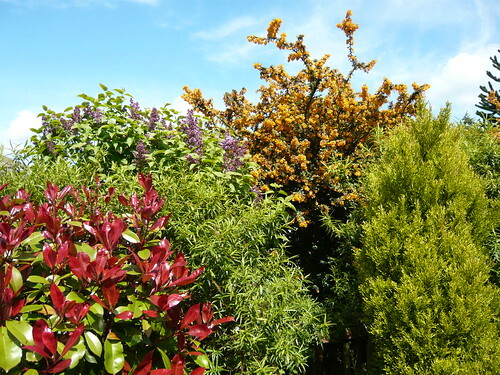 Do not forget the evergreen shrubs like Osmanthus which has red or white young shoots often with colour variations to go with the leathery green leaves. Courgettes, Gourds, Marrows and Squashes.